Discord is a free voice and text chat app designed specifically for gaming. All-in-one voice and text chat for gamers that’s free, secure, and works on both your desktop and phone. 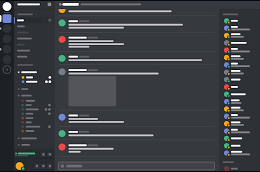 Discord runs on Mac OS X, Microsoft Windows, Android, iOS, Linux and in a web browser. Gaveroid’s Discord server provides voice and text chat capabilities for players while they are using our online game servers. Please make sure you select the correct channel pertaining to the game you are playing. If you are in need of technical support, for the game you are playing or our voice/chat server please jump in to the Support channel and we will try to assist you. By using our server, you agree to follow these rules. Respect the other users, admins and moderators. No harsh profanity (fowl language, sexual innuendo, offensive or derogatory language, etc.). No micspam (saying annoying things, playing annoying sounds – we are lenient with this, but don’t overdo it). No talking about illegal matters. If it is illegal in the United States of America or your country, don’t talk about it. If you’re not sure, don’t talk about it. No recording unless an administrator gives you written permission (and you agree that the staff may record you at any time, with or without notice). You must use PTT if you have a lot of background noise in your area that comes through the microphone. No self-promotion or advertising (linking people to your website, your TeamSpeak / Discord, etc.) without written permission from an administrator. No copyrighted content that you do not have permission to use. All staff decisions are final, and they may take action upon you for any reason whatsoever.